I read this article and found it very interesting, thought it might be something for you. The article is called How the Profound Changes in Economics Make Left Versus Right Debates Irrelevant and is located at http://evonomics.com/the-deep-and-profound-changes-in-economics-thinking/. Economic ideas matter. The writings of Adam Smith over two centuries ago still influence how people in positions of power – in government, business, and the media – think about markets, regulation, the role of the state, and other economic issues today. The words written by Karl Marx in the middle of the 19th century inspired revolutions around the world and provided the ideological foundations for the cold war. The Chicago economists, led by Milton Friedman, set the stage for the Reagan/Thatcher era and now fill Tea Partiers with zeal. The debates of Keynes and Hayek in the 1930s are repeated daily in the op-ed pages and blogosphere today. Economic thinking is changing. If that thesis is correct – and there are many reasons to believe it is – then historical experience suggests policy and politics will change as well. How significant that change will be remains to be seen. It is still early days and the impact thus far has been limited. Few politicians or policymakers are even dimly aware of the changes underway in economics; but these changes are deep and profound, and the implications for policy and politics are potentially transformative. For almost 200 years the politics of the west, and more recently of much of the world, have been conducted in a framework of right versus left – of markets versus states, and of individual rights versus collective responsibilities. New economic thinking scrambles, breaks up and re-forms these old dividing lines and debates. It is not just a matter of pragmatic centrism, of compromise, or even a ‘third way’. Rather, new economic thinking provides something altogether different: a new way of seeing and understanding the economic world. When viewed through the eyeglasses of new economics, the old right–left debates don’t just look wrong, they look irrelevant. New economic thinking will not end economic or political debates; there will always be issues to argue over. But it has the promise to reframe those debates in new and hopefully more productive directions. The term ‘new economics’ is both vague and broad. It is easiest to define by what it is not. 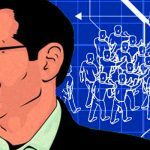 New economics does not accept the orthodox theory that has dominated economics for the past several decades that humans are perfectly rational, markets are perfectly efficient, institutions are optimally designed and economies are self-correcting equilibrium systems that invariably find a state that maximises social welfare. Social scientists working in the new economics tradition argue that this theory has failed empirically on many points and that the 2008 financial crisis is only the latest and most obvious example. Defining what new economics is provides a greater challenge. As of yet there is no neatly synthesised theory to replace neoclassical orthodoxy (and some argue there never will be as the economy is too complex a system to be fully captured in a single theory). Rather new economics is best characterised as a research programme that encompasses a broad range of theories, empirical work, and methods. It is also highly interdisciplinary, involving not only economists, but psychologists, anthropologists, sociologists, historians, physicists, biologists, mathematicians, computer scientists, and others across the social and physical sciences. It should also be emphasised that new economics is not necessarily new. Rather it builds on well-established heterodox traditions in economics such as behavioural economics, institutional economics, evolutionary economics, and studies of economic history, as well as newer streams such as complex systems studies, network theory, and experimental economics. Over the past several decades a number of Nobel prizes have been given to researchers working in what today might be called the new economics tradition, including Friedrich von Hayek, Herbert Simon, Douglass North, James Heckman, Amartya Sen, Daniel Kahneman, Thomas Schelling and Elinor Ostrom. The common thread running through this broad research programme is a strong desire to make economic theory better reflect the empirical reality of the economy. New economics seeks explanations of how the economy works that have empirical validity. Thus behavioural economists run painstakingly crafted experiments to explain actual human economic behaviour. Institutional economists conduct detailed field investigations into the functions and dysfunctions of real institutions. Complexity theorists seek to understand the dynamic behaviour of the economy with computer models validated against data. 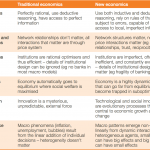 In my book The Origin of Wealth (2007: 97) I offered a table to summarise the contrast between traditional economics and the new economics perspective. I provide here an updated version. Traditional economists often respond that the limitations of orthodox theory are well recognised and there is much work being done to relax restrictive assumptions, introduce more realistic behaviour, heterogeneity, institutional effects, dynamics, endogenous innovation and so on. They are correct and this work is a very positive development for the field. However, much of this work introduces just one element of realism to an otherwise standard model – a bit of behaviour here, a bit of institutional realism there, and so on. It is very hard or even impossible to relax all of the assumptions at once without throwing out the whole structure of the model – in particular without abandoning the core idea that the economy is an equilibrium system. 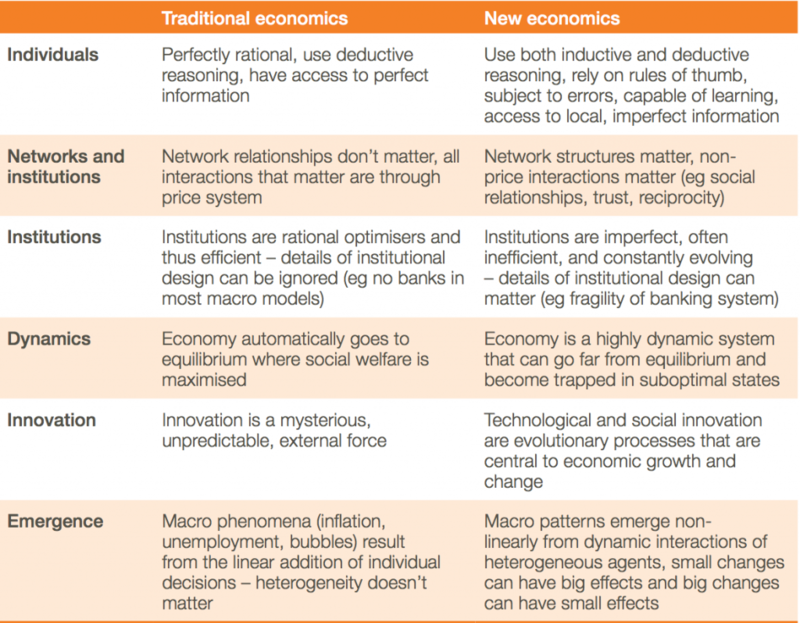 The radical challenge the new economists have accepted is to relax all of the unrealistic assumptions at once, move to the right column of the above table, and create an economics that has much greater fidelity to the real world. It is an enormous challenge and it requires a new toolkit and methodologies. But there is growing evidence that it is possible. That evidence comes from work in economics itself, but also from other fields that successfully model highly complex distributed systems that have many similarities to the economy – for example climate and weather, biological ecosystems, the brain, the internet and epidemiology. Thus what has come to be referred to as new economics is not a single theory, or even a coherent body of work. It is a broad research programme best characterised by its unifying desire to embrace the messy reality of the economy. To accept human behaviour, imperfect institutions, and the complex interactions and dynamics of the economy as they really are rather than what an idealised model says they should be. As policymakers and politicians often rely on the advice of economists and use their theories and ideas to frame their views and debates, this move towards realism in economics should be a good thing. If one thinks of economists as like biologists and policymakers as like doctors, then just as better biology has led to more effective medicine, so too should a more realistic economics lead to more effective policy. In the rest of this essay I will outline three ways in which new economics may impact policy and politics. First, new economics may offer better tools for policy development and analysis – I will discuss an example from the financial crisis. Second, new economics has the potential to change the way we think of the role of government and policy itself, yielding new ways of designing policies in general. Third, new economics offers the intriguing possibility of developing new political narratives – this is the least developed aspect of new economics, but perhaps the one with potential for greatest long-term impact. In 2006, economists at the US Federal Reserve conducted an analysis of what would happen to the US economy if house prices suddenly dropped by 20 per cent. Officials at the central bank had noted the unprecedented run-up in house prices and become concerned. They ran the analysis on their state of the art macroeconomic model and the answer that came back was ‘not much’. Growth might soften, or there might even be a mild recession, but nothing that a few small interest rate cuts couldn’t handle. The model had done exactly what such traditional models are designed to do. It assumed everyone would behave rationally, markets would function efficiently, and the system would smoothly self-correct back to full-employment equilibrium. At around the same time, Fed chairman Alan Greenspan was repeatedly asked by the media, congressmen, and others whether there was a housing bubble. Greenspan, a devotee of efficient market theory and fan of Ayn Rand’s libertarian philosophy, consistently replied that the runup in prices must have good rational reasons, there was little evidence of a bubble, and even if there was, the Fed should not intervene to burst it as the markets would eventually self-correct and government intervention would likely do more harm than good. We all know what happened. The bubble burst and it triggered a catastrophic financial collapse, almost instantly wiped out $10.8 trillion in wealth in the US alone, nearly led to a second great depression, and we are still dealing with the consequences, most notably the ongoing euro crisis. In late 2008, Greenspan gave his famous mea culpa saying, ‘I have found a flaw’ in orthodox free-market theory, ‘I don’t know how significant or permanent it is. But I have been very distressed by that fact. Might new economic techniques and models have given a different view? Might they have helped policymakers avoid such a disastrous outcome? A team of researchers led by John Geanakoplos at Yale, Robert Axtell at George Mason, my colleague Doyne Farmer at Oxford and Peter Howitt at Brown think so. They have constructed (Geanakoplos et al 2012) an agent-based model of the housing market that gives new insights into what caused the bubble and the model could eventually become a tool to assist policymakers in designing strategies for preventing or managing future bubbles. 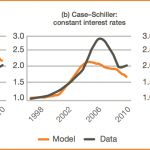 Their model is radically different from the kind of models the Fed used in its 2006 analysis. Rather than look at the economy top-down and in aggregate, they model the system bottom-up. Their model has individual households in it, and for those owning houses rather than renting, individual mortgages backed by houses of a certain value. This population of households is heterogeneous – some have mortgages they can easily afford, some don’t, and the terms of their mortgages may differ. The households are assumed to behave in ways consistent with how behavioural economists tell us real people behave. Rather than doing elaborate calculations the agents in the model use rules of thumb (for example one shouldn’t take on a mortgage more than three times one’s annual income) but individuals vary in their use of such rules (some might be more conservative, others more risk taking). They also introduce institutional realism, for example if interest rates drop you might consider refinancing, but you might not automatically do it if the hassle factor is too high. The initial version of the model uses detailed mortgage and household data from a single metropolitan area – Washington, DC. The team eventually plan to calibrate it with data from other major cities, and possibly the whole of the US and other countries such as the UK as well. Their preliminary findings reproduce the dynamics of the bubble building up and then bursting. Unlike traditional analyses, the model doesn’t gently self-correct, it crashes (see figure 11.1a). They then run policy experiments on the model, asking what policymakers might have done to prevent the bubble forming, or at least stopped it building once it was clear there was one. Analyses using traditional models have tended to blame the bubble on overly loose monetary policy from the Fed. So the team tested scenarios where policymakers raise interest rates. The bubble is indeed moderated, but not eliminated. But interest rates are a blunt instrument and such tightening would also have slowed growth in the rest of the economy. So the team also tried a regulatory intervention – preventing banks from loosening their loanto-value ratios. During the heat of the bubble, banks competed with each other to give loans, loosening their standards. 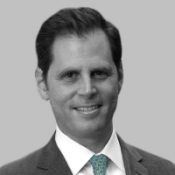 The team’s model shows that by intervening to prevent these standards from slipping, policymakers might have eliminated a key dynamic in the bubble’s formation, prevented the subsequent bust, and done so more effectively and without the collateral damage caused by a big interest rate hike. There are also efforts to use similar approaches to go beyond the housing market and look more broadly at the relationship between the financial sector and the macroeconomy. When the crisis hit in 2008 many senior policymakers were shocked by how little help they received from the formal theories and models of traditional economics. Reflecting on this later, European Central Bank (ECB) president Jean-Claude Trichet said: ‘As a policymaker during the crisis, I found the available models of limited help. In fact I would go further: in the face of the crisis, we felt abandoned by conventional tools. Central banks, finance ministries, and economic regulators all have large staffs of well-trained economists, fancy models and vast quantities of data. But when the crunch came, their theories and models could not describe what they were experiencing. The Economist reported that the Bank of England’s large macro model wasn’t much help because it didn’t have banks in it. It is hard to make policy in the middle of a banking crisis if one’s economic model doesn’t have banks in it. The reason these models and formal theories were of limited use is they were built on assumptions that people are rational, markets always clear, bubbles can’t form, and that banks are just boring bits of plumbing that shuffle money from one part of the system to another and can be safely ignored. It is therefore not surprising that when people started panicking, markets were not clearing, a massive bubble had just burst, and the banking system was on the verge of collapse, that models with such assumptions were not that helpful. It is a bit like building a flight simulator where it is impossible for the airplane to crash. Yet a crisis is exactly when a model should be at its most helpful. The crisis was something beyond the experience of most of the participants; it was highly complex and moving very fast. Intuition and ‘mental simulation’ can be unreliable in such circumstances. Models can be very helpful in augmenting and informing judgment. They can keep track of lots of variables, enforce logical relationships, and search spaces of possibility more rigorously and quickly than the human mind can alone. If policymakers had had better models, they might have been able to run more and different policy scenarios and gained different insights into the crisis. Politics and judgment will always play a key role in major policy decisions – but better models might have given the policymakers better options to choose from. Andrew Haldane (2011), executive director for financial stability at the Bank of England, has teamed up with Lord Robert May, one of the world’s pre-eminent mathematical ecologists and applied ideas from network theory, epidemiology, and food webs in ecology to look at the problem of financial contagion in the banking system. Their work has potentially significant implications for structural reform of the banking system. Doyne Farmer, Domenico Delli Gatti and I are leading an effort supported by the European Commission called Project CRISIS, which is a consortium of researchers building an agent-based model of the interlinked banking system and macroeconomy to provide a simulation platform for policymakers to develop and test policy ideas. While the work is at an early stage and there are many challenges to building a tool policymakers can rely on, there has been significant interest from central banks, finance ministries, regulators, and other economic policymakers. While the examples cited draw from behavioural economics, network theory, experimental economics, complex systems thinking and use computer simulation, there is also new economic work with direct public policy relevance going on in economic history, institutional economics, evolutionary economics, and a variety of other traditions and toolkits. And there is work going on not only on the financial crisis, but also on topics such as climate change, inequality, poverty, economic development, innovation and growth, and other policy-relevant topics. The challenge is bringing this promising, but still early-stage work, into the policy environment. In addition to providing new models and tools for specific issues like the financial crisis, new economics offers a potentially different way of thinking about policy more broadly. Traditional economics views the economy in a fairly mechanistic way. If people are rational and we want to change their behaviour then we just need to change their incentives. Thus, a lot of policy is conducted through tinkering with the tax code or subsidies, for example if one wants more innovation, give an R&D tax credit; if one wants less smoking, tax it heavily. Of course people aren’t immune to such incentives, but often the response is far less than policymakers would like. Likewise, traditional economics views the economy as naturally being in a state of efficiency, and so by definition any interventions move it away from that state, making it less efficient. Thus, interventions are justified by market failures, the need to create some public good, or the need to avoid some negative spillover effects or externalities. For example, state support of R&D might be justified if there are market failures, or taxing smoking might be justified to reduce the externalities smokers create for non-smokers. Finally, policies are evaluated through the lens of cost–benefit analysis, where future benefits and costs are projected and compared. For example, much of the debate on climate change policy has been over competing forecasts of future costs from climate damage and their likelihood of occurring, versus the potential benefits of action to avoid those costs. These mechanistic approaches to policy and regulation are still what are taught in most undergraduate and graduate university programmes, and they pervade the civil service and the pool of advisers and experts that governments rely on for policy development and assessment. Both economists and policymakers have also ignored what George Soros calls the ‘reflexivity’ of the economy. Actors in an economy take actions which change the economy, those changes then change the actors’ perceptions of the economy, which then changes their actions, and so on. But as humans are fallible and our perceptions and interpretations may not always match reality, the two-way interplay between perceptions and actions can send the economy off on a course far from the optimal path predicted by orthodox economic models. Bubbles are a prime example. Soros has also pointed out that these reflexive interactions can create ‘predator–prey’ dynamics between regulators and those being regulated. Regulators take an action to address a perceived problem, that changes the perceptions and actions of market participants, which in turn creates a new set of problems triggering further regulator actions, and so on. Over time this infinite chase between fallible regulators and equally fallible market participants leaves a trail of rules, structures, and institutions that has a major effect on shaping the evolution of the economy. So how might new economics move us beyond the mechanistic view of policy and regulation, and towards a view that takes into account the complexity, unpredictability, and reflexivity of the economy? One area where evolutionary experimentation on policies has been tried explicitly is in development economics, where different interventions are tried across a portfolio of villages or regions, the results measured, and successful interventions scaled up. Michael Kremer at Harvard has conducted field experiments on issues ranging from policies to improve teacher performance, to getting farmers to use fertiliser. David Sloan Wilson, a leading evolutionary theorist, has tried an evolutionary approach in a fascinating case study of improvement efforts in his city of Binghamton, NY. The individual states in the US also provide such a natural evolutionary laboratory on issues ranging from healthcare to education. Other initiatives where there is a diversity of approaches, such as charter schools, end up creating an evolutionary portfolio of experiments, though more could be done to harvest those experiences and scale-up the successful experiments. Second, policies and institutions should be made as adaptable as possible. The predator–prey dynamics between regulators and participants mean there is a never-ending battle between regulators trying to draw rules as tightly and specifically as possible, taking into account all possible contingencies, and armies of lawyers and accountants trying to find ways around them. This often leads to very rigid regulatory structures overlaid on highly dynamic markets. A better approach is to create rules that provide general frameworks, but then adapt to specific circumstances. One example is how California’s building codes have succeeded in reducing energy consumption. Rather than try to predict the state of energy efficiency technologies in future years, the regulators created a set of general performance standards that automatically ratchet-up as the state of technology improves – the standards are set by whatever the best developers are doing at the time. And rather than specify how those standards are to be achieved, developers are offered a choice of pre-approved practices, or experimenting with new ways of meeting the standards. Some developers are happy to go with the pre-approved practices, but others who are competing to meet the standards in less costly or more aesthetic ways have incentives to experiment and innovate. Thus the regulations and state-of-the-art building practices co-evolve with each other. One could imagine similar approaches being applied in areas such as health, transport and education where general performance standards could be set, incentives created for experimentation and innovation, and then have the standards automatically adjust as the system evolves. Third and finally, policymakers need to think of themselves less as social engineers and more as ‘system stewards’. As Michael Hallsworth from the Institute for Government (IFG) explains, rather than engineering specific outcomes, government’s role as system stewards is to create the conditions in which interacting agents in the system will adapt towards socially desirable outcomes. Policy design and implementation are thought of as integral rather than separately, and mechanisms for feedback and continuous learning and improvement are built-in from the beginning. The IFG recognises, however, that such an evolutionary approach may not be suitable for all circumstances. In some situations, for example emergency disaster relief or national security situations, a traditional top-down approach may be required when speed is of the essence, where clarity and consistency is critical, or when the capacity of actors further down the chain is limited. Likewise, politicians are always expected to have clear plans, and simple, easy to understand answers in which they have unshakeable confidence. You would never hear a politician give a speech where she or he says ‘It is a complex problem, we’re not sure what to do. But we have several good ideas that we’ll try on a small scale. We’ll then ramp up the ones that work and close down the ones that don’t, and then have a good shot at solving it.’ For some reason we don’t mind such an approach when it is used by doctors looking for new drugs, energy companies looking for oil, or venture capitalists looking for the next big idea. But we seem to prefer politicians who tell us the world is simple and predictable, even though we know it to be complex and unpredictable. So an explicit, widespread use of new economic approaches to policymaking may require some education of citizens, the media and politicians themselves on the risks of overconfident top-down solutions, and the importance of small-scale failure as a way to learn and prevent large-scale disasters. Perhaps the most intriguing, but least developed, potential impact of new economic thinking could be on politics itself. The tradition of splitting politics into left and right camps dates back to the layout of the French National Assembly in the Revolution of 1789. Over the two and a quarter centuries since, both left and right have seen their political narratives evolve. The left has travelled an arc from Marx and Rousseau, through Victorian social reformers, to Keynes, the New Deal and to modern European notions of social democracy. Meanwhile, the right has travelled from Smith and Hume, through the Austrians, the Chicago revolution, Thatcher-Reagan, and to today’s European centre-right parties and America’s radicalised Tea Partiers. At the heart of both narratives have been differing views on the nature of the economy, the roles of the individual and the state, and notions of freedom and social justice. New economics has the potential to significantly reframe these debates. It isn’t merely a matter of centrist compromise, of just splitting the difference. Rather it is a different frame that agrees with the right on some things, with the left on others, and neither on still other areas. For example, new economic work shows that Hayek was ahead of his time in his insights into the power of markets to self-organise, efficiently process information from millions of producers and consumers, and innovate. But new economic work also shows that Keynes was ahead of his time in his concerns about inherent instabilities in markets, the possibility that markets can fail to self-correct, and the need for the state to intervene when markets malfunction. Likewise, new economics research shows that humans are neither the selfish individualists of Hume nor the noble altruists of Rousseau, rather they are complex social creatures who engage in a never ending dance of cooperation and competition. Humans are what researchers such as Herb Gintis and Sam Bowles (2005) call ‘conditional co-operators and altruistic punishers’ – our cooperative instincts are strong and provide the basis for all organisation in the economy, but we also harshly punish cheaters and free-riders, and compete intensely for wealth and status. Traditional economics tends to frame things in terms of market efficiency versus market failure, and those on the right emphasise the efficiency part and those on the left the failure part. This leads to differing views on the justice of market outcomes. The right generally believes that if markets allocate resources in the most societally efficient way then any interference in that process is morally suspect. Market outcomes may be unequal, but that is because the distribution of talent and hard work in the economy is also unequal – in general people get what they deserve. The left on the other hand tends to see unequal outcomes as an injustice in and of itself, and emphasises how powerful interests use markets to their benefit and can abuse or leave behind the less powerful. People often don’t get what they deserve and the state must intervene to protect the vulnerable, and correct both unfair processes and unfair outcomes. To date there has been very limited work on questions of inequality, social welfare, and social justice from a complex systems or evolutionary economics perspective. But there are hints of a different view. Even models that start with perfectly equal or random distributions of income or wealth can produce unequal outcomes statistically similar to what is observed in the real world. These outcomes emerge because small, random differences can lead to self-reinforcing feedbacks that pull apart the tails of the distributions. For example, two people might start off with equal ability and starting circumstances, but by chance one gets an early lucky break and the other doesn’t leading to compounding differences in income over the rest of their lives. Thus even with equal initial endowments and a fair process, inequality may emerge. The right might be wrong in that inequality might not be merely the result of unequal distributions of talent and hard work and therefore justified. But the left might also be wrong in that inequality might not necessarily be the result of unfair processes. At the same time, the right might be correct that unequal outcomes are a natural and difficult to avoid outcome of market interactions, while the left might also be correct that a growing body of evidence shows that unequal outcomes are strongly associated with a number of social pathologies justifying state intervention to ameliorate those outcomes. In other words, a new economics perspective might not just split the difference on debates such as inequality, it might rescramble the terms of such debates. Finally, new economic thinking may also provide the foundation for new political narratives. Eric Liu and Nick Hanauer, in their 2011 book The Gardens of Democracy, explore the possible shape of such a narrative. They liken the narratives of traditional economics to ‘machine-thinking’ and advocate a shift to ‘garden-thinking’ that emphasises the dynamic, constantly evolving nature of the economy and the interconnectedness of society. The state then plays the role of gardener helping create the conditions in which the garden of society can flourish. It took traditional economics decades to move from academic theory to providing a foundation for policymaking and a basis for our political narratives. New economic thinking still has some distance to go to mature as a body of economic theory, and no doubt it will take time to fully develop the policy and political implications of these ideas. This journey might not end our political debates, but it has the potential to make them far more productive for society. Adapted from Complex New World: Translating new economic thinking into public policy, published by the Institute for Public Policy Research (IPPR).